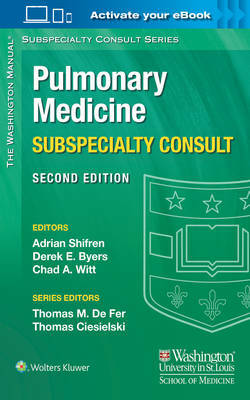 The Washington Manual of Pulmonary Subspecialty Consult, second edition continues to be a concise and practical reference, tailored for fellows, residents, and medical students rotating on pulmonary subspecialty services. It covers both inpatient and outpatient management of pulmonary conditions with the same clinical practicality as the widely popular Washington Manual of Medical Therapeutics. For this edition, the content has been revised to an outline format providing information in a logical and readily accessible format and has been updated to reflect advancing technologies and therapeutics. This manual is the result of a collaborative effort of residents, fellows, and clinical faculty from the distinguished Washington University School of Medicine and serves as a practical quick reference guide to the diagnosis and treatment of pulmonary ailments.